Two runners from the Gotham Stakes return to Aqueduct with their eye on Saturday’s $1 million Wood Memorial. The Grade 1 appears fairly wide open since Hansen opted for the Blue Grass at Keeneland on April 14. Gotham runner-up My Adonis, beaten three lengths, enters the 1 1/8-mile contest with only one off-the-board finish, while going 2-4-1 in his other seven starts. Tiger Walk, fourth on March 3, is 2-0-1 of 6. 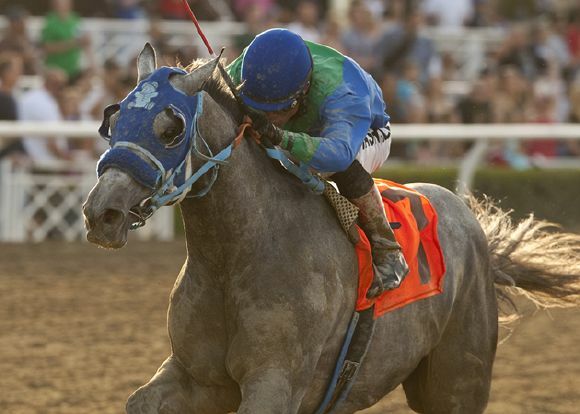 Alpha, one of the more dangerous sophomores, boasts a graded stakes victory in the Withers. The son of ’06 Preakness champ Bernardini, 3-1-0 of 5, also captured a minor stakes this year. After conferring with his physician about his healing injury, jockey Ramon Dominguez announced he will ride a few horses this week and be aboard Alpha. “The doctor was happy with the progress I have made and the tests looked great, but he feels that we should take a conservative approach for now,’’ said Dominguez, who suffered a separated collarbone in a spill at Aqueduct on March 18. The so-called dark horse is Gemologist, unbeaten in five outings, who makes his 3-year-old stakes debut. He did win the Grade 2 Kentucky Jockey Club at Churchill Downs on Nov. 26. Meanwhile, the top four finishers in the San Felipe led by winner Creative Cause could clash in Saturday’s $750,000 Santa Anita Derby. Creative Cause, entering the Grade 1 with a record of 4-1-2 of 7, took a pair of stakes last year as a juvenile. The son of Giant’s Causeway has never failed to hit the board in seven starts, going 4-1-2. Runner-up Bodemeister came off a maiden victory in his second attempt, but could opt for the Arkansas Derby at Oaklawn Park on April 14. Third place finisher Midnight Transfer is 2-1-1 of 5. Liaison, who ran fourth, is 3-0-1 of 6, but has captured two stakes. Mike Smith has picked up the mount on Midnight Transfer because Victor Espinoza suffered a hairline fracture to his left hand in a recent mishap. Smith was aboard Midnight Transfer for the first time on March 30, when the son of Hard Spun posted a bullet 1:11 4/5 for six furlongs on Santa Anita’s main track, fastest of 15 works at the distance. The dark horse in this 1 1/8-mile contest is I’ll Have Another, who counts the Robert B. Lewis victory in his record of 2-1-0 in four starts.